The Halifax Harbour Hopper Tour is always popular with young and old alike. The Harbour Hopper tour is a perennially popular option with Halifax sightseers, combining the best of land and sea. It’s a great way to get oriented when you first arrive. The tour starts off with a run around the downtown area, past classic sights like Citadel Hill and the Public Gardens, before the amphibious vehicle you’re travelling in slides into the harbour for a water view of the Nova Scotian capital. The guides will also tell you about local history like the Halifax Explosion. The tour takes about an hour and runs every day from May through to late October, rain or shine. You shouldn’t normally need to book ahead but if there’s a cruise ship in town, expect a few of the departure times to be filled up. During big festivals like the Busker Festival in August, it’s wise to get your tickets early. 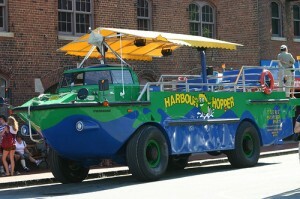 Catch the Harbour Hopper at the wharf by Murphy’s on the Water – a large souvenir shop, restaurant and tour company on Lower Water Street, close to the Historic Properties and not far from the Maritime Museum of the Atlantic. Admission Fees: Adults $24.99, Seniors $23.99, Children 6-15 $14.99, Children under 5 $8.99, Family $70.99. Tour Times: 9am, 10:15am, 11:30am, 12:45pm, 2:00pm, 3:15pm, 4:30pm, 5:45pm, 7:00pm, 8:15pm, 9:30pm.